In a career that spanned more than 40 years, Dr Jim Swan conducted ground-breaking scientific research and helped countless distilleries take their first steps towards making whisky. Described as ‘the Einstein of whisky’ and ‘the ultimate whisky troubleshooter’, his roots lay in Scotch, but he shared his expertise and encouragement with distilleries all over the world. Whisky consultant Dr Jim Swan, who died suddenly at his East Lothian home on Tuesday at the age of 75, was a tireless source of inspiration and technical expertise for distilleries all over the world. On the day after his death, he was due to attend the topping-out ceremony at Lindores Abbey distillery in Fife, which is due to open this summer; 24 hours later, he was scheduled to make one of his regular visits to Penderyn in the Welsh Brecon Beacons, a distillery he had been involved with from the outset. One of Dr Swan’s particular skills – and there were many – lay in enabling start-up distilleries to hit the ground running, using production and maturation techniques to create a spirit that was approachable in youth, but without sacrificing quality. Lindores Abbey, Penderyn and Kilchoman are just three distillery names on an astonishingly crowded and cosmopolitan CV: Clydeside and Annandale in Scotland; Dublin Whiskey Distillery in Ireland; The London Distillery, Cotswold and St George’s in England; Kavalan in Taiwan; Victoria Caledonian in Canada; Milk & Honey in Israel; Amrut in India. And many more. Born on Christmas Day 1941, Dr Jim Swan attained a PhD in chemistry and biological sciences from Heriot-Watt University in Edinburgh. A fellow of the Royal Society of Chemistry, he was an expert in gas chromatography and a founding member of the scientific team put together by Dr Jim Gray at Inveresk Research International – which became Pentlands Scotch Whisky Research Ltd in 1974, a forerunner of what is now the Scotch Whisky Research Institute (SWRI). During a ground-breaking era for Scotch whisky research, Dr Swan created the first Scotch whisky flavour wheel alongside colleague Sheila Burtles in 1979. By the time he left in 1993, he was leading the maturation research group, reflecting an expertise in the role of wood in whisky production for which he was perhaps best-known in the industry. Former Bowmore distillery manager Harry Cockburn also recalls those days. ‘[We] first saw his passion to get the best possible results when he came to Bowmore for a week’s intense study of our production procedures and parameters employed,’ he says. In 1993, Dr Swan and Dr Riffkin joined forces to buy Tatlock and Thomson, the long-established food and beverage analysis business housed in Victorian splendour in Bath Street, Glasgow. The business grew, moved to Fife and, in 2002, Dr Swan left to set up as a globe-trotting independent spirits consultant. If Dr Swan’s travel and work schedule became increasingly frenetic, his personality and character remained as it had always been: calm, courteous and softly-spoken. ‘He was such a popular and warm guy – just a very, very nice man,’ says Stephen Davies of Penderyn. 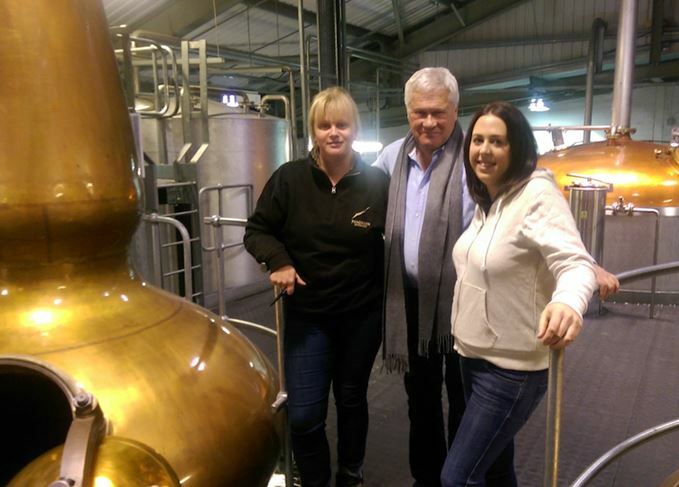 ‘When I phoned him at his home in Longniddry, near Edinburgh, to recruit him as a consultant, I was immediately taken by his warm, personable style and great humility,’ adds Graeme Macaloney, president of Victoria Caledonian Distillery in Canada. Dr Jim Swan died at his home in Longniddry, East Lothian, on 14 February 2017, aged 75. He was married to Thelma with two daughters, Caroline and Victoria, and three grandchildren. ‘Jim was my first and greatest mentor. I first met him in 1992, when I attended a course in The Sensory Evaluation of Potable Spirits run by Pentlands Scotch Whisky Research. ‘It is no exaggeration to say that that course changed my life. He was a brilliant teacher: patient, clear, witty, with knowledge born of long experience, not only book-learning. ‘I worked with Jim over the last 12 years at both Kilchoman and Annandale distilleries, and indeed Jim was the inspiration for me to start up my own consultancy. ‘It’s a sad time for his family and for the whisky industry as a whole. Jim was instrumental in creating the house style of Penderyn: matured in Bourbon barrels and finished in Madeira wine casks. He gave us a style which suited the character of the spirit. None of it would have worked without Jim’s involvement. ‘He had such a depth of knowledge. If we came across a problem and we didn’t have the knowledge locally, you could be sure that he would help, or he would know someone else you could go to. ‘Jim was a true alchemist – every spirit he touched turned to gold. This magical alchemy came from his deep understanding of oak, yeast, malt, the environment, people – and his ability to join it all up and share his knowledge. ‘I listened, learned and understood – not a day goes by when I don't apply the thinking he shared to the whiskies I make today. ‘I had the great pleasure to travel with Jim extensively through Kentucky, Portugal and Spain, visiting cooperages and bodegas with whom Jim had a special relationship. ‘During the long drive from northern Portugal down the Iberian peninsula to southern Spain, we spoke widely of distillation, wood, maturation, but also of Scottish independence, some of the more colourful characters in our industry, the importance of our families, and even religion. ‘We were together at Kavalan in 2006, and last year when commissioning at a distillery in Virginia. What impressed me most was his obvious quest to produce the highest-quality spirit possible, no matter the environment or facilities available. ‘Our yet-to-be released whisky – and world whisky in general – owes Jim a huge debt. As a new start-up distillery trying to find our way in the world and develop our own style, we asked Jim for his guidance – and he was instrumental in helping us to optimise our production process and elaborate our wood programme. ‘Some of his most important work was with Kavalan, including his development of the “STR” (shaved, toasted and recharred) cask. We have embraced this cask as an important element of our signature style, and every time I taste those resinous, fruity oak notes I will remember his genius. ‘One of the best bits of advice I had when setting up the distillery was to get Jim involved. I knew the style of whisky I wanted to produce and thought I knew the problems I was going to face, but I’m not sure I would have succeeded without Jim’s wealth of knowledge. ‘He designed our stills, was always available to assure me that I was doing a good job and giving me the confidence I needed in those early days. Jim’s continued support has played a massive part in Kilchoman’s success, and I will always be very grateful for his contribution. ‘Jim Swan? Modest, charming, gentle in manner, but forensic in his attention to detail. A man who used science to help create art and whose influence, in one of those bitter ironies which come with someone’s passing, may only now be recognised. Sensory evaluation – he helped to move it forward; in wood policy he wrote the textbook. ‘He would always respond to my idiotic questions by mail, phone and, not nearly frequently enough, face-to-face in a bar in some far-off country. He wouldn’t simply answer but, like any great teacher, widen the discussion to further illuminate the conversation. Ncn’ean distillery near Oban is producing single malt whisky solely from organic barley. Building work is now underway following a lengthy excavation process at the historical site.